Re: What was Rio Grande Land? 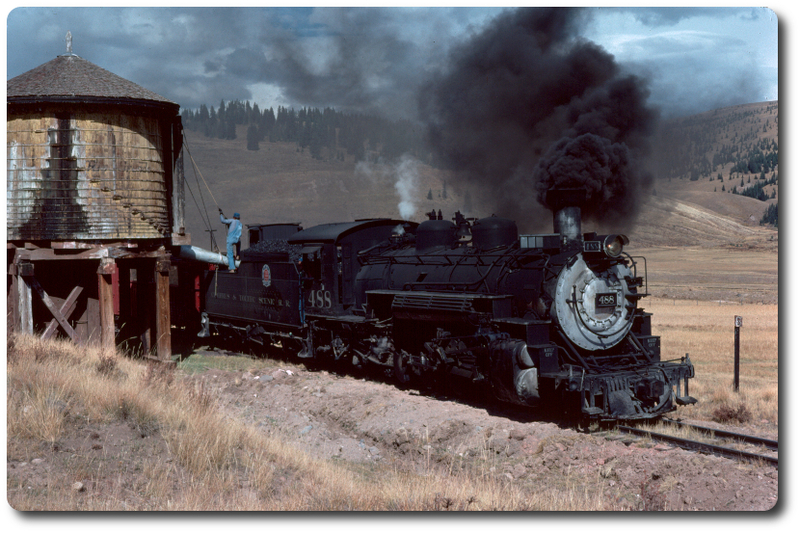 When we rode the Silverton Train (as it was universally called in the 1960's), there was a sign above the ticket window that stated how far in advance the trains were sold out. I recall it being about 10-14 days in advance. Back then the Grande assigned cars, but not seats. One lined up a good hour ahead by your car. 45 minutes before departure a trainman came through counting empty seats. These were sold to folks in the cancellation line. The cancellation line wound through the former express office of the depot in a maze. The office opened about 700, but people began queuing up about 500am. We stayed at the Travel Lodge then and had a good view of the depot and roundhouse before more buildings were built and I remember getting up REAL early the day we rode (I was only 10 or so and so excited about riding the train, I couldn't sleep) and seeing the line stretching off down the sidewalk in the dark. I also remember riding through town in the eveninga and seeing every motel in town with a big NO VACANCY sign up. The RR was a big time player in Durango, and everyone there knew it. One has to give credit to the Rio Grande for their promotion and redevelopment of the area around the depot. In the early 1960's it was pretty rundown with a few scuzzy bars and pretty nasty looking hotels. The RR had absolutely no clue in how to promote and develop a tourist attraction. One of the big arguments they put forth to the ICC in their abandonment case was they were "in the railroad business, not the tourist business". They hired Alexis McKinney away from the Denver Post to manage the renovation of downtown and market the train. Several old structures were torn down including a hotel that stood on the corner of 5th and Main, directly across the street from the depot. This building was not supposed to be torn down and was intended to be another hotel. For years there were signs in a vacant lot saying "Parking for patrons of the Rio Grande Hotel". Initially the restaurant next to the General Palmer House was called the "Grande Palace" and was operated buy the Rio Grande Dining Car Department. They served food on Rio Grande "Prospector" pattern china, There was also a railroad run souvenir shop that sold lots of cool stuff. In addition to the regular postcards, and such they sold dining car china that was deemed surplus. My mom always got a few pieces every time we visited. All that is proudly displayed in a cabinet in my dining room. What was Rio Grande Land?